The Seamaster 2018 ITTF World Tour Platinum Australia Open continues to deliver plenty of drama for spectators in Geelong with yet more big-name athletes departing on day two of the main event. Take a look at some of the main highlights from Friday 27th July. One of the performances of the day came courtesy of China’s He Zhuojia, who knocked out two major stars from the Women’s Singles draw: the qualifier from China opened her account with a stunning outing against sixth seed Feng Tianwei (11-7, 11-6, 11-7, 13-11) before condemning no.3 seed Mima Ito to the same fate in the quarter-finals (11-7, 11-6, 11-3, 6-11, 10-12, 12-10). Mima Ito’s exit in the last eight came as a big shock and in the other quarter-finals tie there were mixed emotions for Japan as Kasumi Ishikawa came out on top against Hitomi Sato (11-4, 11-6, 11-8, 8-11, 11-6) to send one of the country’s players through to the last four at the expense of the other. 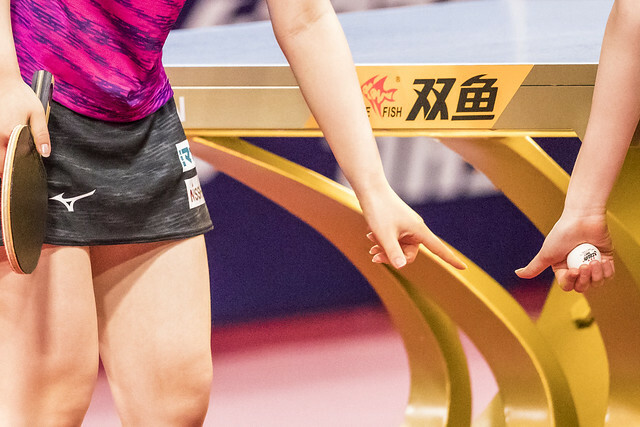 Two further quarter-finals fixtures remain to be played out with Chinese stars Ding Ning and Liu Shiwen set to be involved following their respective victories over Suh Hyowon (11-3, 11-8, 11-7, 12-10) and Gu Yuting (11-9, 11-5, 11-7, 12-14, 9-11, 11-3). The headline maker on the opening day of play with his fantastic showing against top seed Dimitrij Ovtcharov, on day two Yu Ziyang sealed his place in the last eight with a fine display against Japan’s Maharu Yoshimura (11-8, 9-11, 11-6, 5-11, 11-7, 11-7). Next up, Yu Ziyang will face fellow countryman Liu DIngshuao for the opportunity to compete in the penultimate round of the competition. Another player who caught the eye was India’s Sharath Kamal Achanta thanks to a superb display in his opening round match with the no.7 seed from France, Simon Gauzy (6-11, 11-7, 11-7, 11-8, 7-11, 11-4). However, the unseeded Indian star’s hopes of reaching the quarter-finals were dashed by Germany’s Patrick Franziska later in the day (12-14, 9-11, 11-9, 11-3, 7-11, 11-7, 11-8). Xu Xin has made a strong start to his campaign Down Under, accounting for Japan’s Taimu Arinobu (11-9, 10-12, 11-8, 9-11, 11-7, 11-6) and Jin Ueda (7-11, 11-8, 11-3, 7-11, 11-8, 11-1). Day two also marked the end of Quadri Aruna’s journey with the Nigerian star losing out to Yuya Oshima (12-10, 11-9, 11-8, 11-4). The Men’s Doubles action played out as expected as the top two seeded partnerships successfully booked their spot in the final. Korea Republic’s Jeoung Youngsik and Lee Sangsu, seeded first, came away from their semi-finals encounter with the Chinese Taipei duo of Liao Cheng-Ting and Lin Yun-Ju with a commanding straight games win (11-9, 11-6, 6-11, 12-10). Second seeds Masataka Morizono and Yuya Oshima were taken right down to the wire as the Japanese pairing saw off a brave challenge from 2018 Korea Open winners Jang Woojin and Lim Jonghoon (6-11, 11-8, 11-9, 10-12, 12-10). Similarly, in the Women’s Doubles event no.1 seeds Hina Hayata and Mima Ito recovered from a two games to one deficit to eliminate Korean opponents Jeon Jihee and Yang Haeun (11-9, 10-12, 8-11, 13-11, 11-8) while Honoka Hashimoto and Hitomi Sato, seeded second, proved too strong for Singapore’s Lin Ye and Zeng Jian (11-6, 11-9, 11-7) to set up an all-Japanese final.